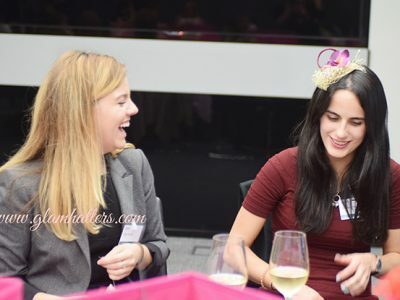 We travelled to the UBS building for their corporate event in London. Their building is in Broadgate and is a hop and a skip away from our Glam Hatters’ studio in Angel. 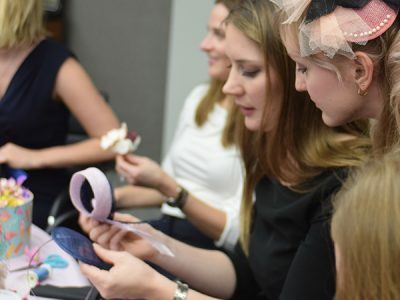 We have a major focus on corporate events in London and we think we’re pretty awesome at delivery our fascinator making workshops for high end corporate events. 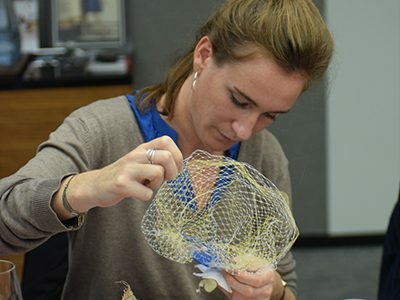 Livi and I spent a lot of time sourcing materials for this fascinator making workshop. We cut up sinamay strips and made bias binding for the sculptural element of the fascinators. We prepped lots of lovely vintage-inspired veiling in a rainbow of soft pastels, along with metallic colours and my favourite a super-soft latte colour. We ordered masses of gorgeous fabric flowers, spent hours putting bead pots together, particularly faux pearls (everyone’s favourite!). We added tulle, vintage buttons, crystals and quills, fascinator bases and headbands. We put together the most gorgeous corporate event in London and we were looking forward to meeting the clients. 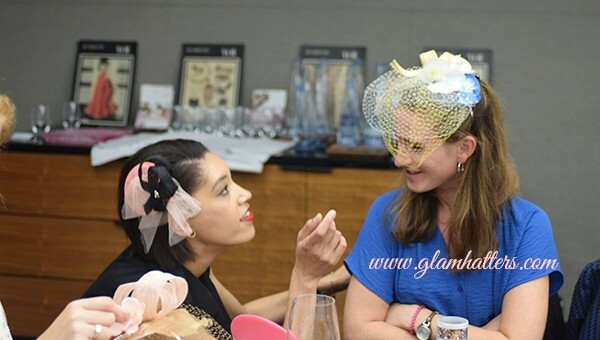 We have the best corporate event ideas at Glam Hatters and we love to work with our corporate clients to deliver fun events for high achievers!! 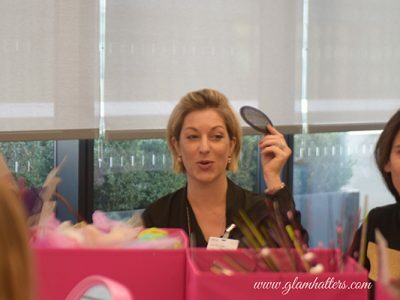 There is always a very focused element to clients at our creative corporate events. This corporate event in London was 2 hours long with a break in the middle for nibbles. Guests were greeted with champagne on arrival and their glasses were topped up throughout the workshop. We find a bit of fizz always help with sewing and creating gorgeous headpieces!!! 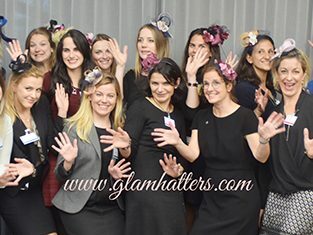 Our Glam Hatter Girls, Livi, Clara, Shabnam and Lena taught at this corporate event in London. Our teachers give a demonstration at the beginning of the workshop and then teach the clients step-by-step throughout the workshop. No client gets left behind during our workshops! 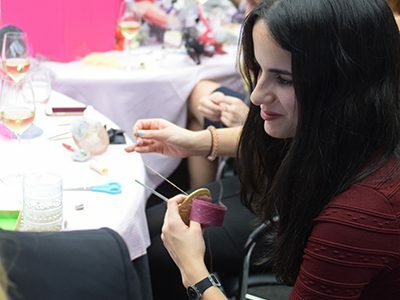 There are lots of teachers on hand to help out with tangled thread or to subtly add in a couple of stitches to keep everyones fascinators on track. Our team is made up of highly skilled, very kind, talented, fun and patient teachers and they all love what they do. All our Glam Hatter Girls are all art school trained and have a wealth of experience in hosting corporate events. 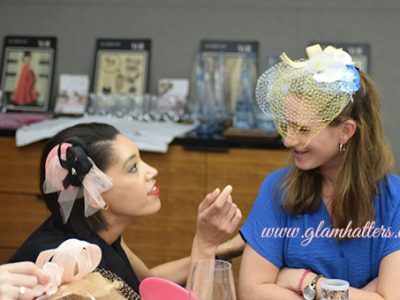 This means that every person will finish their fascinator and will have a beautiful piece that they can actually wear to the races or a wedding. Which means the pressure is off and the clients can enjoy the process, have some serious fun! If you are looking for ideas for team building activities for your corporate event in London please do call Janie or contact us on the form below. We love what we do and would be delighted to make your corporate event one that everyone wants to go to!!! 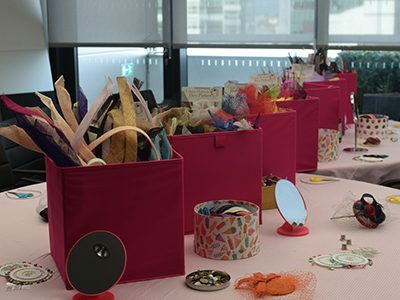 Take a look at our Corporate Ideas or have a scroll through our workshops.